Above: In contrast to last week's 'full house', only Gyula attended our English Bible Study on Thursday night. This turned out to be a blessing as I had more one-on-one time with Gyula to explain the Gospel. 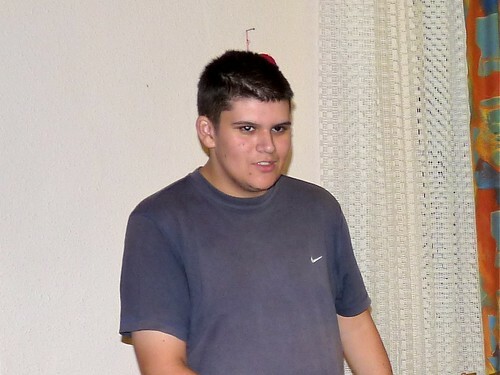 Gyula is the type of guy that just fades away in crowds, slow to speak and very shy. It was encouraging to see him open up and talk freely about what was going on in his personal life when there was not a crowd. Our conversation lead to the topic of trust, and having someone we can fully trust in life. I was able to share with Gyula that Jesus is fully trustworthy and never acts selfishly to take advantage of us. 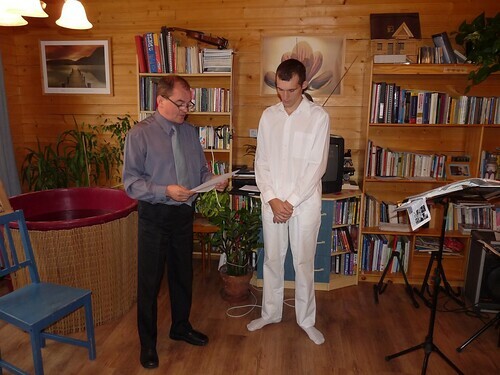 As I asked Gyula about his religious background, he told me that he has been brought up in an atheist home. Our study through the book of John is his first exposure to Jesus and His Word. It was exciting to see how Gyula began to understood Jesus' words in our study: “Destroy this temple, and in three days aI will raise it up.” (John 2:19) He is starting to understand the very basics of Jesus' death on the cross to redeem us from our sins and about Jesus' resurrection from the dead. Please pray for Gyula to gain complete understanding of the Gospel and to be saved into a relationship with God through faith in Jesus Christ. This past week, as Sharon was running errands, someone asked her if only handicapped and mentally challenged people attended our church and outreaches. As I think about this person's comment, it became clear why she would say something like that. We have a church member who has noticeable permanent damage from a stroke, a past regular attender who's daughter was mentally handicapped (and has since died), a regular attender who as an adult suffers from schizophrenia, and a few more who regularly visit who are mentally handicapped. With such a small congregation in these beginning stages of our church, this makes up for a noticeable amount in our body... and I am glad that these who are often rejected in this culture feel welcome and at home with us. 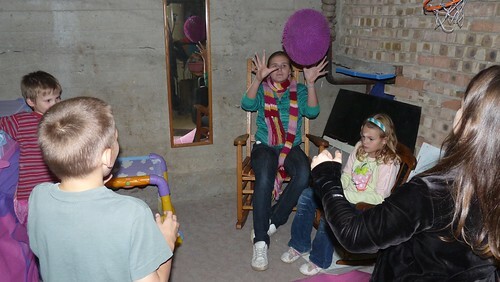 Above: Meanwhile in our the basement, Niki hung out with the kids while we held marriage class. 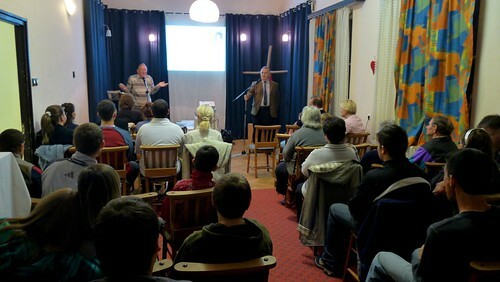 Above: Dr. Eric Barrett, a retired scientist, returned to PetÅ‘fibánya to give his second lecture seeking to draw people's attention to God the Creator and Jesus the Savior. Dr. Barrett laid out groundwork for why he believes there is no intelligent life, nor a planet which can sustain life like the created earth and created humanity on earth in our solar system. Through this lecture, a few new relationships were created (an answer to prayer!). Gyula (mentioned above) brought his parents. And Gizi who is a regular attender to our church brought her husband who attended our church for the first time after this lecture. We praise God for drawing more people to himself through Eric's outreach. Above: Eszti and Niki. I am meeting with NIki before worship service to prepare for her baptism. My desire is to focus on foundational truths of the Gospel and our focus Sunday was on God's work of giving us a new heart (regeneration). I was thankful for Peti's brother who was visiting church for the first time today to also sit in and listen to our class. Most likely, this was the first time that Peti's brother was hearing about our problem of being sinners, and God's grace in sending Jesus to pay the price for our sin. I could see that in our study time, he wanted to answer some of the follow up questions I posed to Niki to test her understanding. Praise God for doing a work in Niki's heart and for drawing Peti's brother into our church for the first time to hear His the Good News. Healing for Allen and Kira and for teammate DezsÅ‘ who is also experiencing flu-like symptoms. GOD'S ANSWER: Kira was able to return to preschool on Monday and is doing much better. Allen and DezsÅ‘ are still recovering, please continue praying for them. GOD'S ANSWER: After only having one student two weeks ago at Bible study, I asked you for prayer. I was asking God to show next steps and to draw new people into the group. This week we had a total of six students! Two of them were brand new and two others had only attended once before. They all expressed their intent on continuing to attend. One new student, Klári is the daughter of Klári (a bit confusing) who has attended our study for months. In our study of Jesus, when I highlighted Jesus' claim to be the only way to the Father (which stands opposed to the 'modern' idea that there are many ways to God and salvation), Teenager Klári was engaged and was shaking her head in agreement. As we continue to go through the book of John, I pray that these students will have a clear understanding of what Jesus taught that they may properly respond in faith in the Son of God. 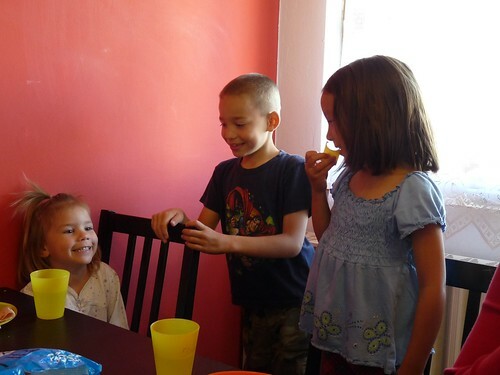 Klári's daughter, Klári was recently diagnosed with the same celiac disease that Ben and Elianna have, and Sharon has had more points of connection because of this to build a relationship with her. Klári's teenage daughter seemed to enjoy the time and was very thankful for some gluten free chocolate cake that Sharon offered her before she left our Bible study. Please pray that she will return. What an accurate picture of where the world is headed and where the world is today! I told her how many people will have the "appearance of godliness", practicing different forms of spirituality, but not truly having a relationship with God through Jesus Christ. At the end of the night we were able to share prayer requests and pray for Kati, Gabi and Niki. We praise God for the opportunity to reach out to Kati and trust that the seeds that were planted tonight will bear fruit. Friday-Saturday-Sunday teen conference. That Norbi, Niki, Peti and Hugi would be encouraged in their faith and in their prayer life as they attend a conference that teaches about the importance of prayer. Also strength and help for Sharon who will be at home with our three kids while Allen attends the conference. GOD'S ANSWER: On Friday afternoon, Sharon began to feel sick. Praise God that He sustained her and she was feeling better by Saturday morning as she was with the kids by herself while I was at the conference. One of the young men who attended with us, Peit almost decided not to go last minute after feeling exhausted from a long and physically draining work week. In the end, he decided to come and by Saturday, he repetitively said, "I'm so glad I decided to come." The entire conference was focused on lessons on prayer. The organizer was amazed at the response, thinking that the topic of prayer might not attract many teens. 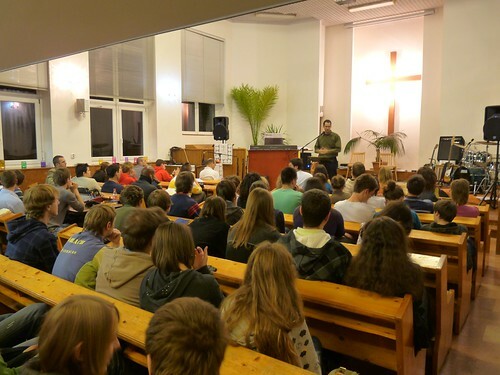 By Saturday, the church was packed with over 200 teens from different areas of Hungary. Above: Norbi helping us to haul sleeping bags to the conference. Above: The Baptist church of Szekesfehérvár where the conference was held. 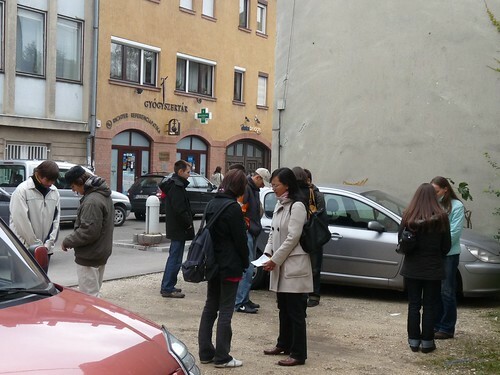 Above: Saturday prayer walk praying at different stops throughout Szekesfehérvár. One conference speaker told the story of a girl over 50 years ago who was one of the first to come to faith in the town. Because of rejection for her decision from her family, she was kicked out of her house and had to sleep outside for two nights. That night under the trees in an empty field, she prayed that God would build a church there. It turns out that we were sitting in that very place she prayed! A place where there was once no church and just a few believers where there is now a Baptist church holding a conference for teens focusing on prayer. Praise God! Peti who is a new believer said that God freed him from fear of man when praying publicly. He said He has a greater understanding of his personal communion with God while praying out loud and no longer is concerned with what others may be thinking. After a pastor spoke about the idols of our day and our calling to turn from them to Jesus, he gave an invitation for anyone to come forward before God to repent and receive His forgiveness and to live in His grace which is freedom. When I opened my eyes as we began singing worship after the call to repentance, my whole row was emptied into the center aisle on their knees. Practically all the pews were emptied and the teens were on their knees filling up the aisle. Niki also responded to Saturday's night call for repentance and said that she felt the burden of sin fall from for the first time. She said that she wanted to walk as a new creation in Jesus Christ and no longer in sin. On Sunday, Niki told me in our church service that she would like to be baptized. Please pray for her as she will begin attending a class designed to bring clarity to various aspects of the gospel and to help her to count the cost in this decision of becoming a follower of Jesus Christ by faith. 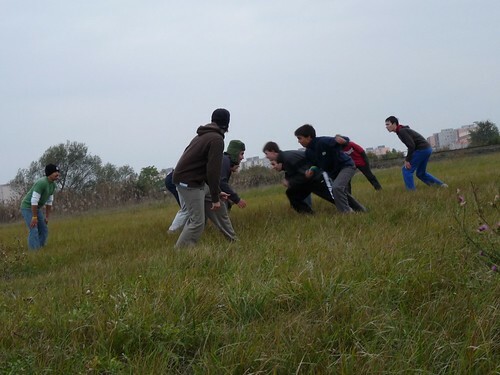 Above: Hindsight: Probably not a good idea to play tackle footbal with Hungarians at the conference when you have flu-like symptoms. But I couldn't resist. In the end no one was hurt and we closed our game in a huddle and praise to God for our time together. Please pray for continued financial provision as we have increased financial needs. 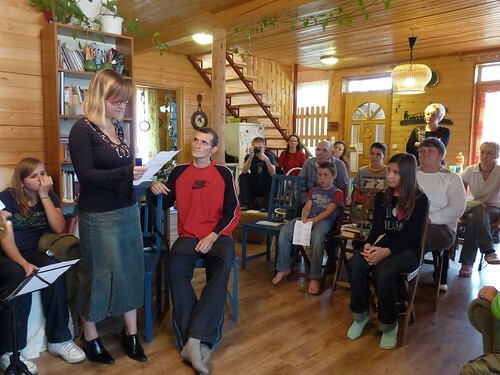 Pray also for financial provision for our teammates, Miki and Erika and DezsÅ‘ and Marcsi. 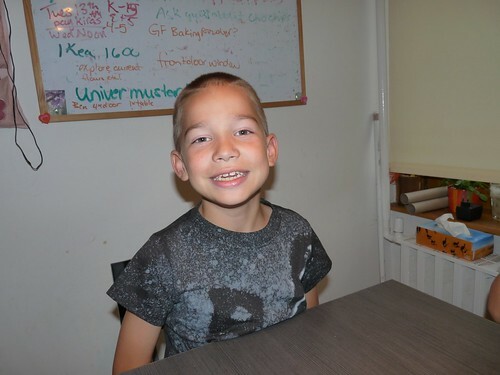 GOD'S ANSWER: Last week, we got news of a few supporters giving an unexpected amount that will help us cover the extra costs involved with medical bills related to the loss of our child and increased grocery costs due to the kids specialized diets. Praise God! Moreover, while grocery shopping last week, the store Sharon frequents happened to have a new stock of gluten free foods that were not put on display on time leading to a 50% reduction of the whole lot. This gave Sharon an opportunity to stock up at a reduced cost on gluten free foods for Ben and Elianna. Above: Sisters, Lidia and Eszti with teenager Niki at our Sunday worship service. Above: Ben's craft at school had him take natural objects to make pictures of animals. 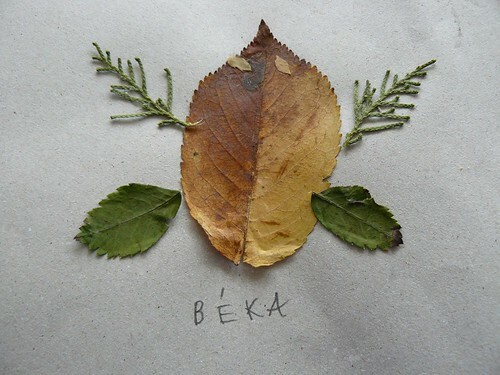 'Béka' means frog. 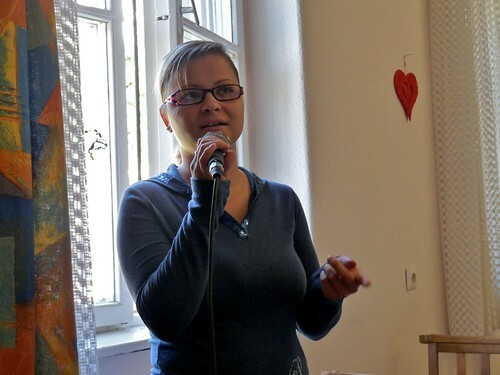 Above: Elianna taking part in a special presentation for the retired folks in PetÅ‘fibánya. 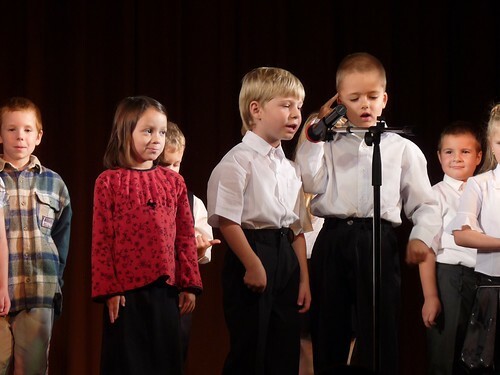 She was able to recite a Hungarian poem from memory and had a lot of fun participating in folk dancing with the kids. Above: Cute Kira in the kitchen. • Complete healing of Allen. 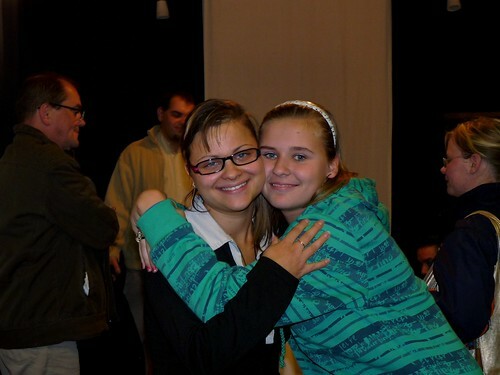 • Niki's faith to be strengthened and stability in her decision to be baptized. • Saturday Evangelistic Lecture: Dr. Eric Barrett, a british scietist will join us for the second time giving a lecture entitled "Are we alone in the universe?" Please pray for the word to get out for God to draw people to Himself through this outreach. Pray for new relationships to be developed through this outreach and for old relationships with the lost to be strengthened. Above: Ben a little excited about being able to go on the hike which is usually only open to teens. This would be our last hike offered for the teens until next summer, as winter is quickly approaching. 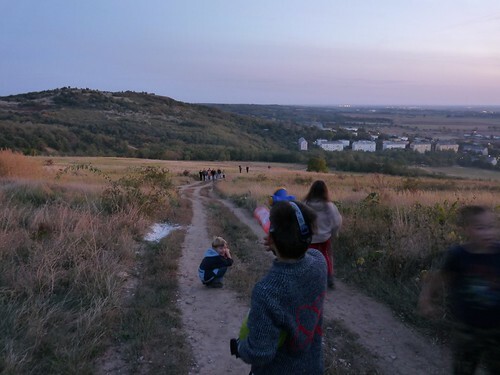 Above: The kids and teens really enjoyed making there way up the mountain, enjoying the beautiful weather and sun set over PetÅ‘fibánya. 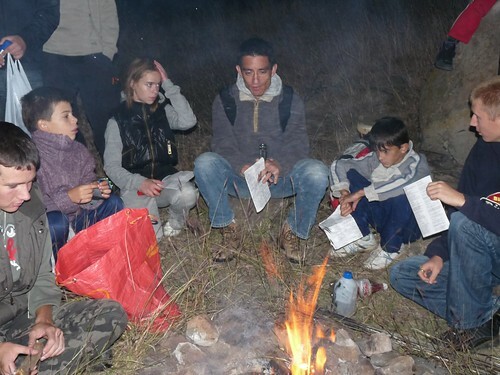 Above: After settling around the campfire, teammate Roger was able to give his testimony about how he came to know and put his faith in Jesus Christ. For most of these teens (and kids) this is their first exposure to hearing the Gospel. As they attend our Friday night outreach, we hope to live among them as role models, especially for the teen boys who have no father figure at home. It is our hope that they would all choose a relationship with our Father who has proven His love and faithfulness to us through Jesus Christ. Above: Seated on a rock on the right is EnikÅ‘ and Eszti. EnikÅ‘, who made a decision to put her faith in Jesus Christ in this year's English camp, commuted all the way from Budapest to hike with us. 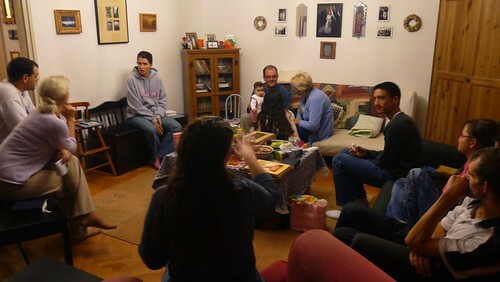 It is a joy to see EnikÅ‘ continue to grow in her faith even in the midst of close famiy members opposing her decision. It was also a joy to see church member Eszti (far right) be an encouragement and friend for EnikÅ‘ on the hike. Above: Even though she looks like a teen, Eszti has four children and has begun serving in our teen ministry as her mother in law is able to watch her kids. Along with church members Gabi, Hugi and Peti, Eszti has begun attending ministry training for the past month as she takes on more responsibility on our worship team and in our Friday night outreach. 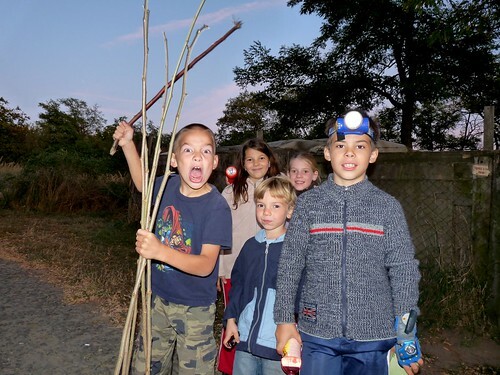 God has given us the calling as leaders "to equip the saints for the work of ministry, for building up the body of Christ" (Eph 4:12) From the inception of the church in PetÅ‘fibánya we have been looking for those God is raising up to take our place. We are very encouraged that God has graciously been building these members up! Above: Over the past few months, I have been privileged to go through the foundations of our faith and the Gospel with Peti (seated in red shirt). Out of the three that were attending this class that is required before baptism in our church, Peti was the only one who felt called to publicly declare his faith in Jesus through baptism. Above: DezsÅ‘ and Peti, just before Peti made his way to our baptismal. 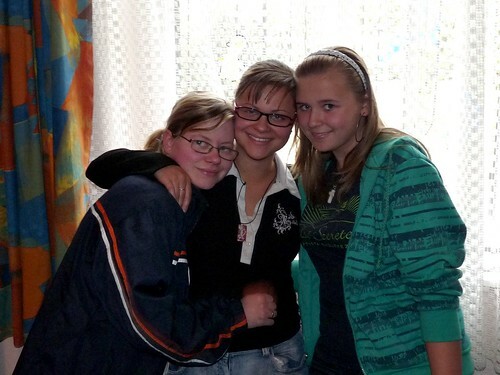 DezsÅ‘, Peti and Gabi have been attending a Bible school one Saturday a month. The bulk of their work is done through extension, completing required reading assignments and writing papers before their monthly meeting. This is a great opportunity for all three of these men who are in different stages of life. DezsÅ‘ is attending out of response to God's clear calling him into the pastorate. Peti is attending as a fresh believer in Jesus who has a family and four children. Gabi is attending as a young man with remaining questions about future direction in life. All three will benefit with a strong foundation in God's word as they continue to follow Jesus. Above: Eszti must be feeling elated as she had been praying for her husband for years. In repeated attempts to draw him into our church and outreaches, Peti seemed very resistant and very closed to the whole idea of a personal relationship with God. Peti even told me that he remembers the day when Eszti returned home after being baptized years ago and felt indignant about the whole matter. It wasn't until this year, in a seemingly random event (a hike with Miki and Roger), that Peti recalls something happening in his spirit. Before the hike, Peti had been attending our Friday night outreaches and had been hearing testimonies and Bible teaching each week. He said that while he was on the hike, it was just like something all of a sudden changed and he was convicted that God was true. We believe this was a miraculous work of God's grace, just as Jesus spoke about in John 6:44, "No one can come to me unless the Father who sent me draws him." Miki gave Peti a Bible that Peti began reading for the first time with an open heart. Soon afterwards, Peti put his faith in Jesus and has been growing ever since. Praise God for His continued work of grace in the hearts of those who were once enemies and are now brought near through Jesus Christ's work on the cross as redeemed children. 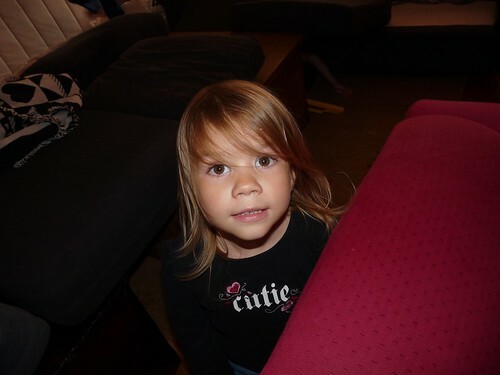 Above: We had to pull Kira out of pre-school last week because of sickness. She was gracious enough to pass on her sickness to dad and now both of them are experiencing flu like symptoms. Even while sick, Kira somehow keeps the family laughing with her hilarious dialogue about life and off the cuff comments at just the right time. After lunch the other day, Ben came to Sharon asking if he could do something. Kira, sitting right next to Sharon, blurted out in her robot voice, "NOT- UNTIL - YOU - FINISH - YOUR - HOMEWORK - BENNI." Above: Ben continues to be a whiz kid at school, racking up the equivalent of straight A's in his classes. His soccer season has started again and he spends most of his free time riding his bike around town with dad or building new lego creations in his room. 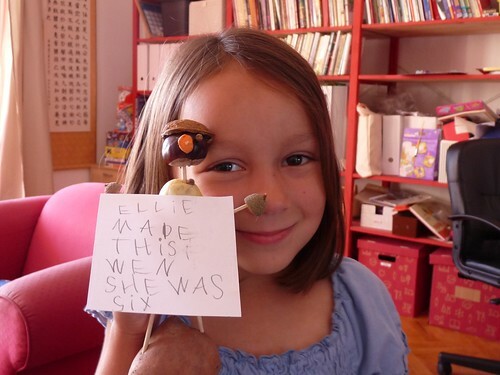 Above: Ellie's crafty creation that she made in pre-school. Ellie has shown the most dramatic changes due to changing her diet in response to being diagnosed with celiac disease. Her language skills in picking up Hungarian are progressing and she is much more able to socialize with other kids at school. These are two areas where she previously struggled, most likely because of constant pain in her belly and tiredness associated with celiac disease. Last year she could only handle three days of school before looking exhausted, and this year she is going every day and is even starting a dance class. We praise God that this disease was properly diagnosed at a young age, where in most cases it is not discovered until much later in life. • Healing for Allen and Kira and for teammate DezsÅ‘ who is also experiencing flu-like symptoms. • Friday-Saturday-Sunday teen conference. That Norbi, Niki, Peti and Hugi would be encouraged in their faith and in their prayer life as they attend a conference that teaches about the importance of prayer. Also strength and help for Sharon who will be at home with our three kids while Allen attends the conference. • Please pray for continued financial provision as we have increased financial needs. 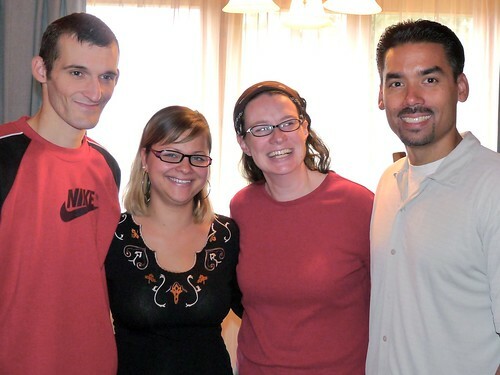 Pray also for financial provision for our teammates, Miki and Erika and DezsÅ‘ and Marcsi.